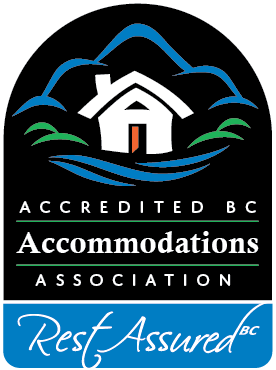 All Bed & Breakfast members of Accredited BC Accommodations are listed on this page along with their phone numbers, and the name of the town in BC where they a located. For those members participating in marketing, you can click through to their enhanced listing. Did you once hear about a BC inn that sounded like a spectacular getaway in this province of Canada, and you know if you saw the name you would be able to remember it, but you can’t quite think of it on your own? Browse the comprehensive list of BC inns below and there is a good chance you will find it. This is also a good page to browse to find a BC inn that may just tickle your fancy. How can you not be intrigued by a British Columbia Bed & Breakfast named Apothic Boutique Bed & Breakfast? If you’re looking for romance, perhaps you will consider Crystal’s View. Scroll down the list until you find a name that catches your fancy – you may just find an inn you’ll want to revisit again and again.